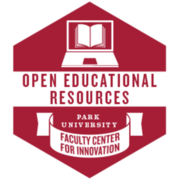 Open Educational Resources (OER) are freely accessible, openly licensed text, media, digital assets and learning objects that are useful for teaching, learning and assessment. Such resources typically require no cost and can be integrated to support and supplement student learning and course resources. This badge demonstrates an understanding of Open Educational Resources for use in higher education. Recipient has learned about and implemented Open Educational Resources (OER) practices to the extent that she/he can influence the learning of others inside or outside the Park University community. He/she has shared their expertise on the topic of Open Educational Resources in one or more Park-sponsored or FCI-sponsored events (such as presenting an FCI Innovation Exchange, creating an FCI “Two-Minute Mentor,” presenting at a Department, School, or College meeting, facilitating a session at the Annual Assessment Institute or a similar University-wide event).